And so, as trailed at the end of last week, we begin Westlake Week Mark II, wherein, apropros of nothing other than I've had a fair number of first editions of his books turn up in the mail recently, I'll be grouping together a bunch of Donald E. Westlake-related posts, including showcases of those aforementioned first editions (many of them Dortmunder novels), a review of a Richard Stark book, a look at Westlake's signature, and possibly more besides, although we'll have to see how we get on. I did a shorter, three-day Westlake Week back at the start of August, and judging by the view stats a few of those posts were rather popular (as ever helped along, no doubt, by links to them from Trent at Violent World of Parker). 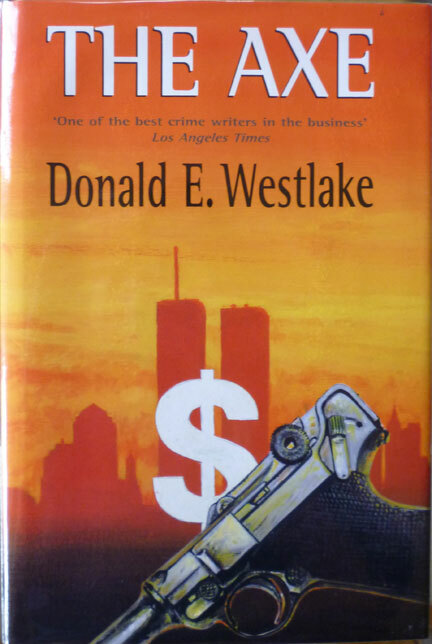 A UK hardback first edition of Donald Westlake's The Axe, published by Robert Hale in 1999 (originally published as The Ax – no 'e', of course – by Mysterious Press in the US in 1997). 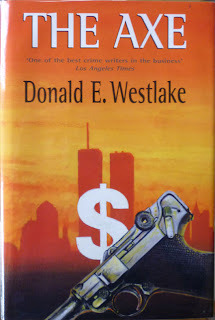 Like a lot of the Donald Westlake/Richard Stark books published by Robert Hale in the late-1990s/2000s, it's not always easy to find first editions that aren't also ex-library, despite the fact that these books weren't published that long ago. It's not uncommon for the bulk of a hardback printing to go to libraries, so I guess that's what happened in a lot of cases with the Hale Westlake/Starks. So I was pleased to come across this copy of The Axe, which is in fine condition. The jacket illustration on this edition is by Michael Thomas, which makes a change; usually Derek Colligan provided the jacket illos for Hale's Stark/Westlake editions. 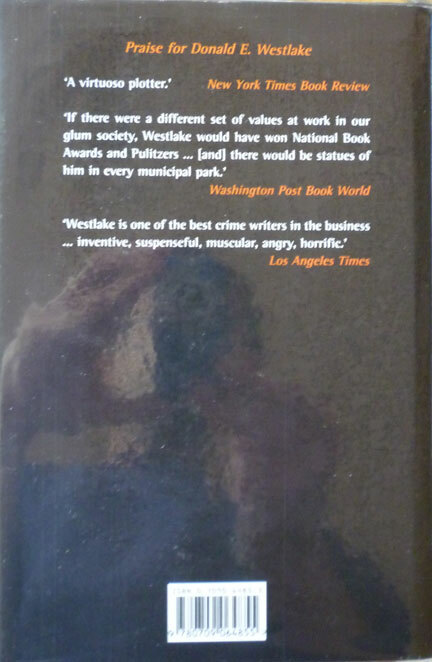 As for the novel itself, The Axe – or The Ax, if you please – is widely considered one of Westlake's best books, perhaps even his best. 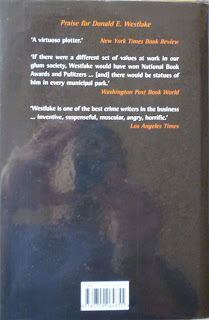 It's a serious character study about an unemployed executive who murders the other candidates for his ideal job; I'm thinking of shuffling it to the top of my Westlake to-read pile, ahead of the various Parkers, Dortmunders and others. I didn't know Hale had published any of the Stark Books. Interesting. The Ax is a terrific novel. Am I the only one annoyed when publishers change spellings for the local market? I find it jarring when reading a book by a British author featuring British characters when I come across "color" instead of "colour" in the American edition. The Ax is an American novel, by an American writer. Does the publisher think its readers are so dumb as to not be able to figure out that we usually don't have an "e" at the end of "ax" over here? I guess Hale just figured it might look odd to British readers, who are more used to seeing the added 'e' version. But I wouldn't be surprised if the interior text (I haven't checked this yet) uses the American spelling; it's kind of a publishing convention that UK versions of American books don't anglicize the interior text, but do anglicize any cover text ('colour' instead of 'color', for instance). I dunno why that is – UK novels are generally printed in the UK, so they wouldn't be able to use the same printing plate as the US version anyway, thus saving the expense of a plate change. I can't even see how UK publishers might save money on proofing by keeping the American spelling; presumably they'd need to proof a novel whether they were anglicizing it or not. Christ that was a boring reply. Nick - a present to EE from HftB. I was watching Costa-Gavras's film of The Ax (2004) and guess who walks onscreen at the 22 minute mark? He just happened to be in France, I guess. The movie is pretty good - faithful to the book (albeit set in France and Belgium) but a little too long. Feel free to republish the photo at EE. I've done just that, Matt. Excellent spot, and thank you for the pic!